AAA’s free online Roadwise RX tool can help drivers and their families understand common side effects of prescription drugs, over-the-counter medications and herbal supplements. It also flags interactions between these medications that can impact safety behind the wheel and gives users a free report they can take to their doctor or pharmacist to learn how to mitigate possible crash risks. Learn more at http://roadwiserx.com and https://seniordriving.aaa.com. DENVER — If you take multiple medications on any given day, you’re certainly not alone: Nearly 50 percent of older adults report using seven or more medications while remaining active drivers, according to new research from the AAA Foundation for Traffic Safety. The only problem? Nearly 20 percent of older drivers use medications that can increase their crash risk by up to 300 percent. A record 42 million adults ages 65 and older are driving on America’s roads — a number expected to increase substantially over the next decade, making them the largest driving population. Per AAA research, 20 percent of them regularly take medicines, such as benzodiazepines and first-generation antihistamines that are known to carry impairing effects such as blurred vision, confusion, fatigue or incoordination, which pose serious crash risks behind the wheel. • Cardiovascular prescriptions: Treating heart and blood vessel conditions (73 percent). • Central nervous system prescriptions: Treating parts of the nervous system, such as the brain, and including pain medications (non-narcotics and narcotics), stimulants and anti-anxiety drugs (70 percent). 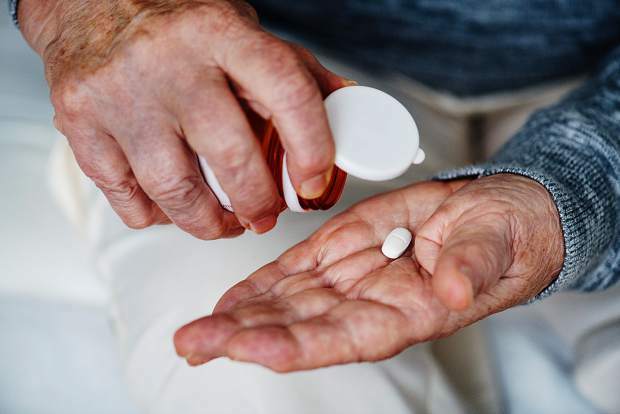 Previous research from the AAA Foundation for Traffic Safety found that fewer than 18 percent of older drivers report ever receive a warning from their health care provider about how their prescriptions impact their safety on the road. Additional data from the American Society of Health System Pharmacists shows that 34 percent of older adults are prescribed medications by more than one doctor, possibly bypassing opportunities to determine how new prescriptions interact with other medications. • Come prepared: Write down any vitamins, supplements and prescribed or over-the-counter medications you take, and bring that list with you to every medical appointment. • Ask questions: Share that medication list with your health care providers at each appointment, and ask about potential side effects or interactions that could affect your driving. • Discuss alternatives: Risks can often be reduced by taking alternative medications, changing the doses or changing the timing of the doses to avoid conflicts with safe driving.